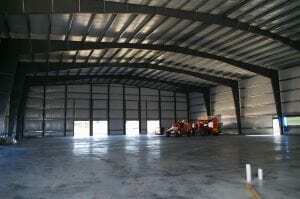 Steelsmith Inc Steel Buildings » Why Choose a Steel Building? When determining what type of building to construct, prospective customers often look for similar qualities. They want the building to be highly customizable, energy efficient, environmentally friendly, and long-lasting — all of this but also at an affordable price. Only a steel building excels in each of these essential areas, and Steelsmith has a long history of completing successful projects on-time and on-budget in quick manner. Durability and longevity are perhaps the least surprising attributes of a steel building. These are the best-known qualities of steel, and are frequently why customers initially seek out steel building options. Compared to other raw materials like wood, steel has a much superior strength-to-weight ratio and can withstand heavy snow and wind loads that might challenge lesser materials. In addition, steel buildings require very little structural maintenance since they will not rot or organically deteriorate, keeping your future costs minimized. Moreover, steel buildings are highly customizable and versatile and can be built to satisfy a wide variety of uses. Steel buildings are used for everything from agricultural storage to airplane hangars to indoor sports facilities and can accommodate any unique application you might have. Steelsmith buildings are custom-engineered so that each building we design and erect is specific to your exact needs. We understand that no one falls under the one-size-fits-all umbrella, so we only create steel buildings tailored perfectly for each customer. Steelsmith professionals prioritize value engineering. We understand that there is often a difference in the up-front cost and the in-place cost of a building. It makes no sense for you to use a less expensive part in your building if it costs more for you in the long time. Sometimes a relatively inexpensive upgrade in the quality of a part used yields considerable savings over the long term, vastly improving the affordability of your building. 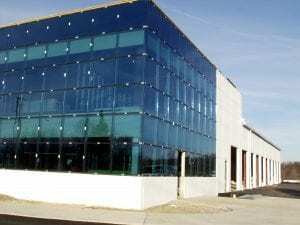 Energy efficiency is one of the many ways we value-engineer our steel buildings. Rising energy costs are among the most important concerns for our customers, and it is essential that we design our buildings with this in mind. Energy efficiency is achieved through both our superior designs and by our use of best practices during the erection process. An often unexpected benefit of steel buildings is that they are environmentally friendly. We use steel manufactured in the United States, where over half of the steel produced is made from recycled material. Steel is by far the most recycled product in the country – in fact, more steel has been recycled in the United States than the second, third, and fourth-most recycled materials combined. Additionally, since steel buildings are not made of organic compounds, they do not emit noxious or toxic fumes that harm air quality. The combination of low start-up costs, cost-effective building materials, and minimal long-term maintenance makes steel buildings an affordable building choice. Additionally, the durability of steel ensures that the building will retain its value through the years, adding to the resell price of your property. There are countless reasons to choose a pre-engineered steel building when you are contemplating your next construction project. Steel buildings are affordable, durable, can be customized to suit your building needs, and also are fast to erect on the job site. 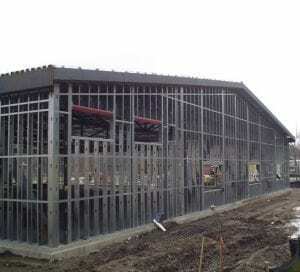 Steelsmith steel buildings provide every important advantage in construction projects, which is why steel is increasingly becoming a more popular choice among customers for new buildings.